What to Look for When Shopping for an Electric Knife? Which is the Best Electric Knife? With a regular knife, you will have to manually move the knife back and forth in order to cut or slice something. Well, with an electric knife, the attached knife blades (usually two pieces of blades are joined together) will automatically move back and forth at high speed to do the cutting and slicing for you. The knife blades are serrated - so they have sharp teeth that accomplish the task of cutting and slicing. Since the knives are sharp and fast-moving, the result will always be clean. You won’t even need the electric knife ​sharpener for hunting knives and other sharp objects as these will naturally stay sharp. It’s not always easy to produce a clean cut, you probably know that by now. A dull knife, for example, will tear through the flesh of meats and probably result in broken pieces. And if you’re slicing through a thick and tough type of food, you might even find it hard to penetrate through it. The joy of owning electrical devices in the kitchen is simply great. For cooks and chefs, a complete array of kitchen tools is a dream come true. Below are some of the benefits of owning an electric knife. 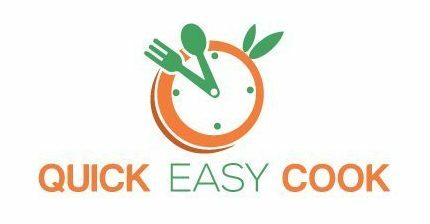 Easy to use – Electric knives are made to have comfortable handles so as not to experience cramps when using this device. They also have 1-button control system to simplify the whole procedure of cutting and slicing.. It requires little effort from the user - The only role of the user is to guide the electric knife and to put some pressure on the device when it hits something hard (such as bones like when you use the boning knife). 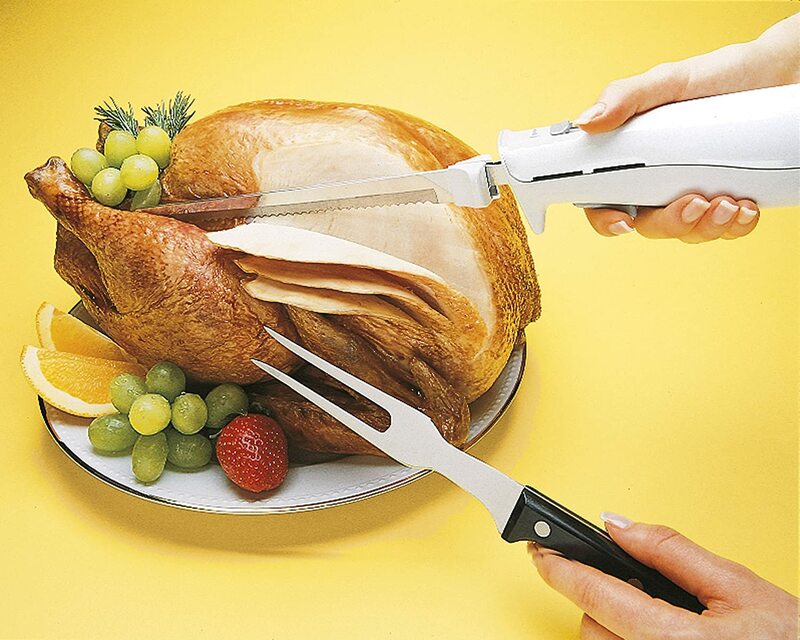 It's a multi-functional device - Electric knives can be used on tough types of food (like roasted turkey) and soft types of food (like bread, fruits, and vegetables). This knife can handle any ingredient and cooked food effectively. It is able to deliver clean cuts - With your guidance, an electric knife can cut thick and thin slices of food (according to your preferences). Since you will be using your electric knife on a wide variety of food, it should serve its purpose very well. The checklist below will serve as your guide when checking out the features on a particular model of electric knife. Cord length - The length of a unit’s cord is important because you might want to slice food on the dining table instead of on the kitchen counter. It lessens the trouble of having to use an extension cord, that’s all. The design of handle - You want to be able to hold onto your electric knife securely and comfortably. Made of dual stainless steel blades, you can be sure that this electric knife from Cuisinart is a great tool in the kitchen. The blades on this particular model measure 8 inches, which is long enough to cut through large pieces of food. Its handle is also ergonomically designed to be comfortable. In fact, right handed and left handed users will find it easy to use. This is a complete package from Cuisinart. It comes with 2 sets of electric knives (1 for carving ﻿meat and 1 for slicing bread) and a knife block to hold all the pieces together. You have the option of keeping the holder in the standing or lying position. There’s also a safety lock to hold the sharp knives securely in place. Operating this device is simple and easy (even for non-techy people). The trigger control is located under the handle, so you can easily press the button during operation. The knife blades can also be quickly removed by pressing the release button. 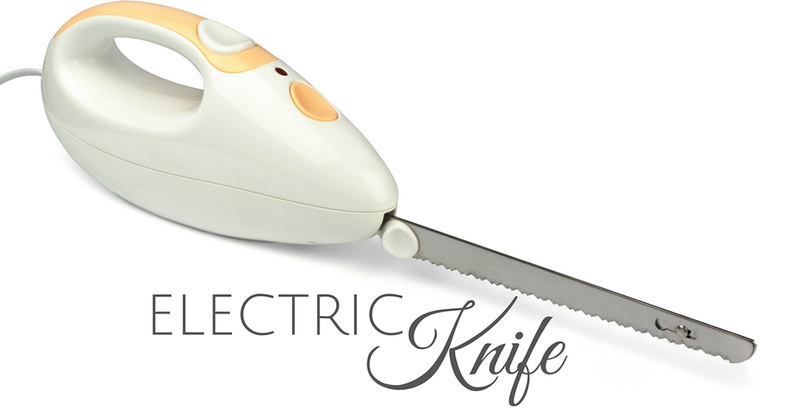 With a 4-foot long cord, managing the electric knife in the kitchen becomes trouble-free. It’s long enough so as not to require the use of an extension cord. This can be the best electric knife set for chefs and cooks since it’s an all-around kitchen device. You get 2 set of knives and a knife block as well. The cord on this device is long. It’s quite expensive when compared with other models of electric knives. The dual blades on this electric knife are made of stainless steel. As we all know, stainless steel materials are durable and they will remain sharp for a long time. 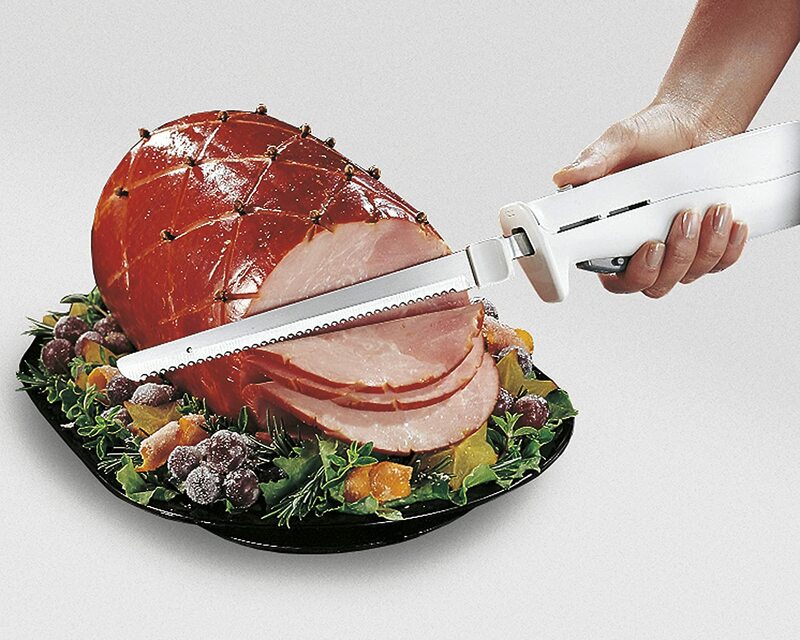 You can slice different types of food with this model of electric knife – including meats and bread products. You will get a package that consists of knife blades, handle, carving fork and a storage case when you decide to purchase this item. The blade measures 7.5 inches, which is the ideal length for cutting and slicing standard sizes of food. The carving fork, on the other hand, measures 12 inches long. Operating this device is easy. It comes with an easy-to-grip handle so that you can control the direction of the knife while using it. Removing the knife blade is also simple as it easily ejects from the handle with just a push of a button. Cleaning this unit is not that troublesome, too. While it’s advisable to hand wash the knife blade, the accompanying carving fork is dishwasher safe. This model may not be the electric knife for cleaning fish, but it will work for meats, bread, fruits, vegetables, etc. There are many items included in the package. It comes with a powerful motor (100 watts). The knife blade is not dishwasher safe. This model of an electric knife comes with a 7-inch stainless steel blades (dual blades, to be exact). While the length of the knife is not that long, it can easily handle regular sizes of food. Note that this particular package only consists of the knife blades and handle. The handle is suitable for use by both right and left-handed people. Removing the blades (for cleaning or storing) is also simple as there is an eject button located at the top of the handle. To operate this device, simply push the power button and the knife will start cutting and slicing away. It also comes with a safety switch so that it can’t run accidentally. Cleaning this item is just as simple. First, detach the knife blades from the handle. You then have a choice between hand washing the blades or putting them in the dishwasher. For the handle, simply wipe it with the damp cloth. While this may not be the electric knife for filleting fish, you can count on it for carving the turkey and slicing thick cuts of meat. The knife blades are dishwasher safe. Knife blade is not that long and can prove to be limiting. If you're always carving roasted turkeys, you will find this model highly useful and effective. 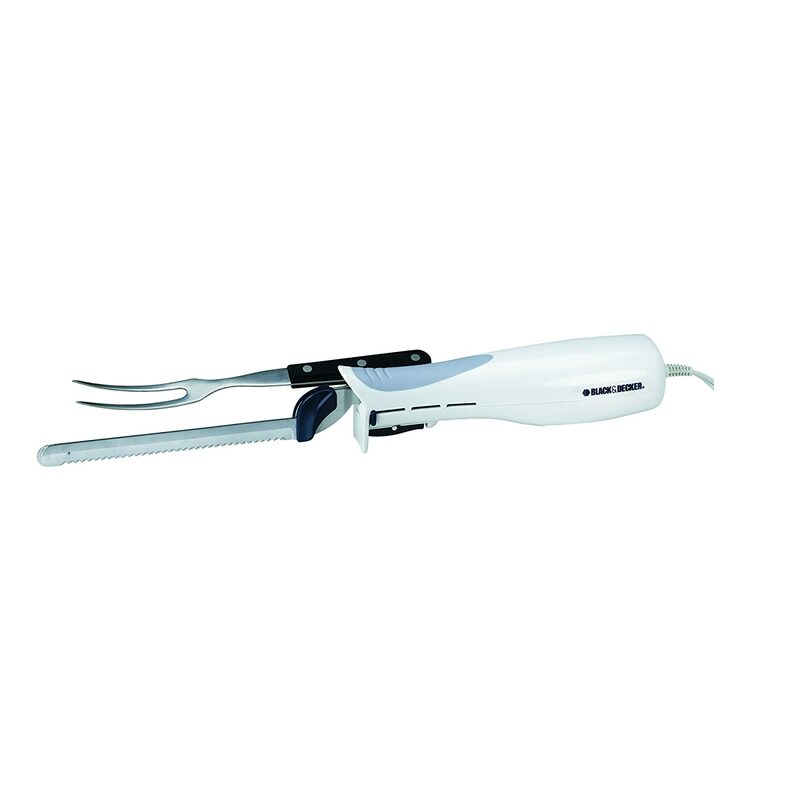 It comes with 10-inch dual knife blades that easily attach onto the unit’s handle. Basically, the package is comprised of the handle and the blade. It comes with long blades. Operating the device is easy. It doesn’t come with other accessories. The blades on this model of electric knife are made of sharp and durable stainless steel. The length of the blade measures 6.5 inches – which is quite short (but can accommodate small portions of food). This is a simple package that consists of the handle and the dual knife blades. The pieces are detached from each other when packed. That’s also the ideal way to store the unit – the knife blades should be ejected from the handle. Since it comes with a simple touch button control, operating this electric knife is extremely easy. Controlling and directing its course is also trouble-free. If you have a really limited budget, this would be a great choice for you – because it’s really quite cheap. If you don’t mind the short blade, this would be a great electric knife for cutting raw meat (among other things). The stainless steel blades are high-quality and durable. Handling and operating the device is effortless. It comes with short knife blades. As you can see, I have discussed the most important features of each of the models of electric knives presented here. And to make it even easier for you to decide, I have also listed the pros and cons of the different products. Looking at all the great items reviewed here, I can still say that the winner is the Cuisinart CEK-40. I like it a lot – and for a lot of reasons. Its package consists of 2 knife blades so that you can use a specific blade for carving meat (tough types of food) and for bread (soft types of foods). This is also a good electric knife for frozen meat. As a bonus, it even has a knife block included – so, that makes storage very convenient. In spite of being the most expensive model of the electric knife on our list, I still recommend it to you. It’s clearly a value pack as you are getting a lot of items when you purchase the Cuisinart CEK-40. While the other products reviewed here are also good, they’re simply not as good as the Cuisinart product (that’s just my opinion, of course). And hey, you can still choose from the other products if you want to, as guiding you is the sole purpose of this report. So, take your time in deciding and make sure that you will choose the electric knife for your needs. Next time, I will make a report on the knife sharpener for beginners – so watch out for that! 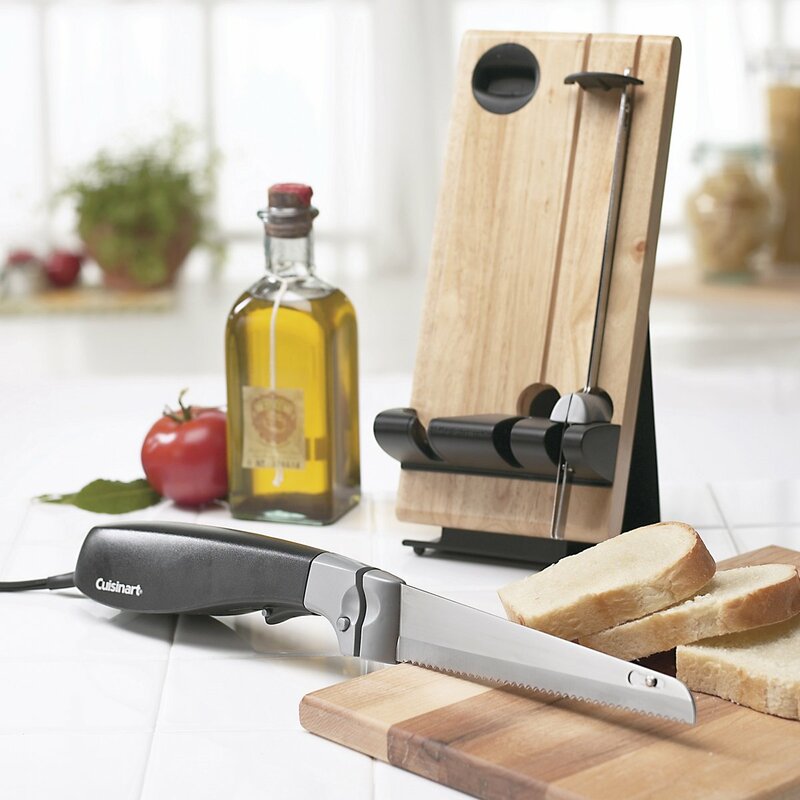 For more electric knives and knife sharpeners, check out our list of cutlery & knives.